Before programming with the NI ELVIS III, you must first create an NI ELVIS III project. With an NI ELVIS III project, you can group together all the files relevant to your application and run VIs on the NI ELVIS III. Complete the following steps to create an NI ELVIS III project by using the NI ELVIS III Project template. Click Create New Project in LabVIEW to display the Create Project dialog box. Select Templates»NI ELVIS III from the project category. Select NI ELVIS III Project from the project list. Click Next to configure details of the new project. 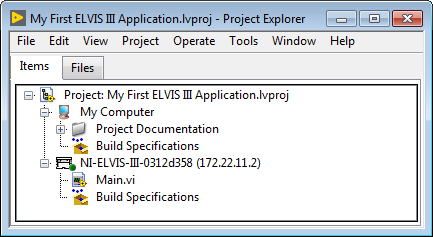 In Project Name, enter My First ELVIS III Application. In Project Root, enter the path to the directory for saving the project. (Optional) In File Name Prefix, enter a prefix that distinguishes different copies of templates you create. Under Target, select the NI ELVIS III on which to run your application. Click Finish. LabVIEW saves the project and opens the Project Explorer window. Explore the Project Explorer window. For example, expand items in the project tree to find Main.vi. Refer to the Project Documentation folder for detailed information about the NI ELVIS III project. Use the Project Explorer window to manage the NI ELVIS III project you have created. Managing the targets, VIs, and other support files of a project from one location. Connecting the host computer to the targets, setting target properties, and deploying VIs to targets. The following figure shows the Project Explorer window when you add the NI ELVIS III and its chassis to a LabVIEW project. To add a chassis, right-click the NI ELVIS III target in the Project Explorer window and select New»Targets and Devices. Locate the chassis you want to add and click OK.
Project root—Contains the host computer and the NI ELVIS III you add to the current project. To add more targets to the project, right-click the project root and select New»Targets and Devices from the shortcut menu. My Computer—Represents the local or host computer as a target in the project. Build Specifications—Includes build configurations for source distributions and other types of builds available in LabVIEW toolkits and modules. RT Target—Represents the NI ELVIS III you add to the project. 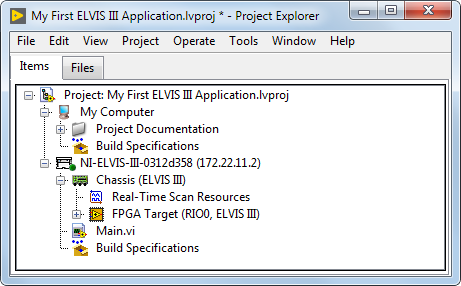 VIs and libraries that you add to the NI ELVIS III appear under the target in the Project Explorer window. FPGA Target—Represents the FPGA target on the NI ELVIS III. Build Specifications—Includes specifications for building source distributions, stand-alone real-time applications, and zip files. Go to Programming the Control I/O next.